When I lived in London I used to make what we Brits call tiffin or fridge cake all the time. Working all hours and living in what amounted to a glorified shoebox which had mice, the kitchen was almost non-existent and I didn’t dare use the oven for fear of what I might find inside. Needless to say, a snack requiring no baking was all I could muster any inclination for. I didn’t really know what a superfood was or how to cook with them. Traditionally, fridge cake is made of crushed biscuits, syrup, raisins, cocoa and chocolate. A delicious snack combination but one that contains a lot of refined sugar and isn’t the best energy stabilizer. It’s something I’ve been itching to recreate since I began eating a wholefood vegan diet because (as you’ll know if you’ve looked at any of my other recipes) I really don’t like snacks that give you a sugar slump. 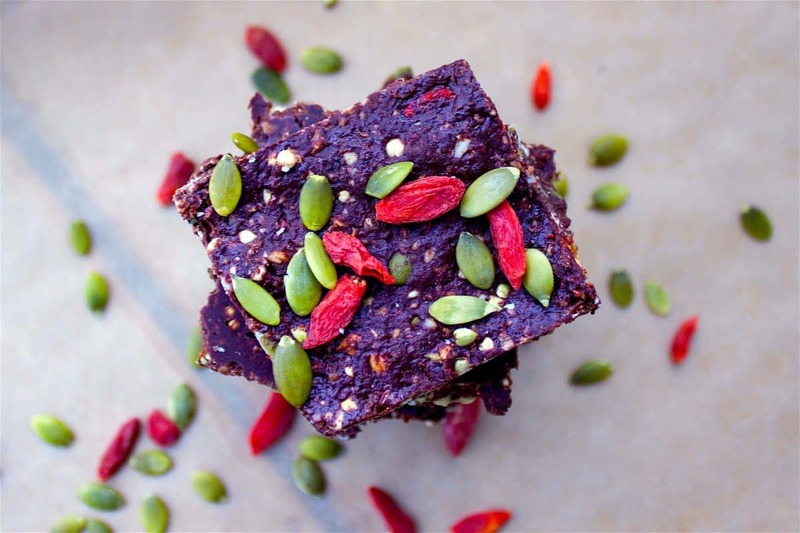 These superfood no-bake cakes have a real superfood kick (hello goji berries, pumpkin seeds and cacao), are low in sugar compared to their traditional counterparts and contain lots of protein to stabilize blood sugar levels. They’re really easy to make and are great as snacks or desserts. Although they contain no biscuits, the buckwheat groats actually work pretty well to create a crunchy texture and the cacao powder + coconut oil give them a chocolatey richness. Blend the almonds and walnuts in a food processor or blender for 10-20 seconds, until they resemble breadcrumbs. Pour into a large mixing bowl with all dry ingredients. Mix thoroughly. Stir in the coconut oil and maple syrup and mix well until combined. Turn the mixture out onto a baking sheet lined with parchment paper. Press down evenly until it forms a layer about 1.5cm thick. Freeze for 1 hour. Remove from the freezer and cut into squares approximately 6cm wide. Store in sealed tupperware in the freezer until required. 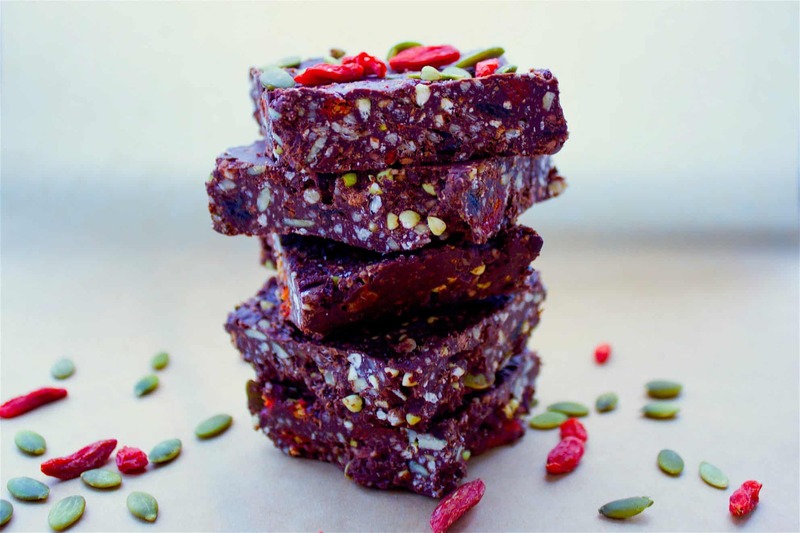 Note: Feel free to experiment using any superfood combinations – try creating your own flavours!